SUMMER 2018 $2100/week plus refundable Security Deposit NO Other Fees No party Rentals. Weekly only in summer (Saturday to Saturday)Contact owner for exceptions. West facing on the building end and outside corner with close ocean and beach views equivilant to four floors up from the ground assures expansive panoramic views to the ocean. 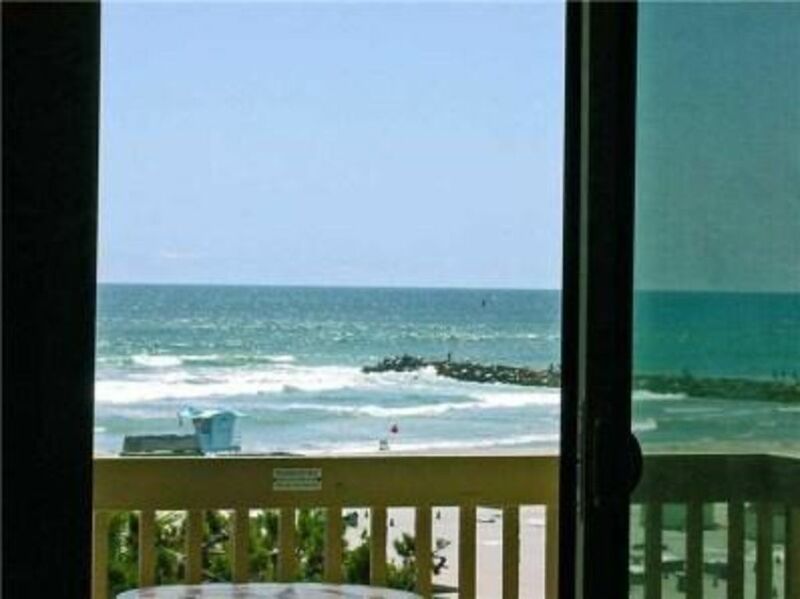 The higher elevation assures added security and privacy while the adjacent wide sand beach is accessible from the nearby elevator or stairs and out the adjacent gate. See beach and ocean views straight on from every window and your balcony. You'll enjoy watching the sailboats, the beachgoers, the kite fliers, the surfers and simply gazing at the ocean from this location. Inside the views are sit down or lay down. ~ No interior stairs to navigate. ~ Lots of tall windows for plenty of light and cross ventilation. ~ Condo is well outfitted for singles, couples and families. ~ Hear the surf inside the condo. ~ Comfortable and well maintained furniture. ~ Bathrooms have operational windows for natural light and see the beach if you're tall enough. This location is adjacent to a beach somewhat off of the beaten track and mostly visited by vacationers. During the summer our beach is lifeguarded and there is a swimming area and a surfing area. There is no on street parking which is wonderful for keeping traffic down and added peacefulness. The marina village lights at night are magical across the river/lagoon and it is an easy walk. There's no raucous buffoonery to deal with vacationing at this accommodation since there's no public access immediately adjacent or in front while you fully experience the ocean and beach surroundings on your terms. Please contact Frank Grasso for additional information or questions. Occasionally availability changes with little notice. Thank you for reading and ask about the one bedroom condo option if this interests you. In Common Area. Coin operated. Free internet provided. No refund or discount for possible service provider outages. Yes we have a livingroom. Large Pool - Large Outdoor spa in lagoon setting - Shared gas barbeque area near pool area and showers and restrooms - Close up beach and ocean views - Internet Service - Gated complex - Gated parking - Near pier - Near harbor and marina village - Second reserved parking space available. clean, comfortable, great view, excellent and a friendly owner to work with. I wanted to take a second to write a review so that anyone looking for a vacation rental can know that this one is a true gem! This trip was for my daughters 18th birthday so we went with her best friend and her parents. There was plenty of room for us 3 adults and 2 teenage girls. The master bedroom has a queen size bed, bathroom with a shower, a vanity, closet and wonderful views. The second bedroom has two single beds, a bathroom with a shower, closet and wonderful views also. The living room has a couch that turns into a bed. Just off the living room is a dining table and a balcony that has awesome views of the ocean. We loved falling asleep every night to the sound of the ocean! The kitchen is great! They provided everything we needed to cook our meals there. It has a full size refrigerator, microwave, dishwasher, tea kettle, coffee pot and a lot of dishes, silverware, pots and pans. Not only that but they even thought of the little things to make things easier for us like condiments, coffee, filters, dish soap, dish towels and much more! There was plenty of towels, sheets and extra blankets (when you come from somewhere like Arizona 70 degrees can get pretty chilly.) :) There were body boards, beach chairs an umbrella and lots of toys for the kids to take down and play with in the sand. They really go out of their way to make sure you have everything you need. Although we still brought lots of stuff with us so we were very glad to see there was an elevator to bring our stuff up to the condo! It was great being able to walk right down to the beach in no time at all! The condo complex was great! The entire grounds were beautiful. We enjoyed the pool, BBQ's and feeding the fish! The girls really enjoyed taking paddle board lessons at the harbor which is in walking distance from the condo. The harbor also has some restaurants and small shops that are fun to visit. Frank was so great to work with and such a nice person. We are so glad we found him and this wonderful condo because now we have a favorite vacation spot that we hope to go back to many many more times and would recommend this condo to all of our friends and family. If you are looking for a beach getaway you can't go wrong with this one!! All rates subject to change. I know these posted rates can be confusing. Please contact for best available pricing. It is always best to deal with the owner direct. I am not an agent. Frank Monthly Rate: CONTACT OWNER This condo has a 1bd 1ba option. Off-Season * 2bd 2ba $1000 per week - discounted for additional nights. *$150 per night. * 1bd 1ba $750 per week - discounted for additional nights. *$125 per night. *3 night minimum Shoulder Season May 27-June 17, 2017 2 Bedroom 2 Bath $1500/week Season (June 17, 2017 to September 9, 2017): * 2bd 2ba $2000 per week. * 1bd 1ba $1300 per week. **Occasional last minute short stays available. Deposit/Security: * $250; refundable by mail. Additional fees: * Costs are plus tax. * No check in fee. * No cleaning fee. * Extra reserved parking space available at no fee.